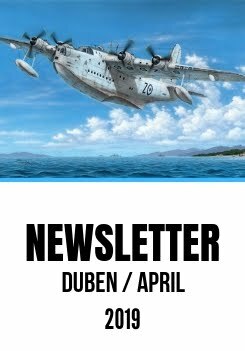 In our November newsleter, we are going to bring you three new model announcements. Two of the new models will be released in Hi-tech format, which as it seems, is much more favoured by the modellers these days comparing it to a standard edition. The sale rates of our 1/32 Hi tech Yak-3 fighter plane model also seem to confirm this fact, the model has been on our offer since the late August and we would estimate that it will have been completely sold out by the end of November. And as early orders have priority, we would recommend you to act rather swiftly and secure your orders without any hesitation. is an xls file for download with all canceled items which will not be in sale anymore. Please, remove them from your system and do not order them. Thank you for understanding. In 1914, the Nieuport company intended to take part in Gordon-Bennett Trophy with a new sesquiplane racer the Nieuport X which was constructed by Nieuport´s new chief designer, ing. Gustave Delage. However, the 1914 trophy was cancelled because of the Great War that had just broken out and the Nieuport X type began to be produced in slightly adapted version for the military instead. Known as the Nieuport Nie 10 and built either as a single seater or a double seater, it was used by the French Aviation Militaire, British RNAS (this service was the first to order the Nie 10) and also by the RFC. Among other important services that used the Nieuports were also the air forces of Belgium, Italy and Russia. The Italians and Russians built their machines under a licence. The two seater versions also differed by having the pilot either in front (Nie 10AR)or in the rear cockpit (Nie 10AV) and were used in the reconnaissance and observation role, the single seaters on the other hand flew in a fighter role. Their armament varied a lot as well as the type of the armament mountings. With the advent of more advanced and dedicated fighter machines and more powerful two seaters, the Nie 10s were being relocated to training units. The model comes on two sprues with plastic parts and contains also a set of resin parts, a PE fret and a decal sheet. The marking options provided cater for three machines, a French, British and a Belgian one. The French Nieuport was operated in Macedonia by MF388 unit, wearing a big Cross of Lorraine, the British machine with no. 8517 had several air victories over German airplanes to its tally and the Belgian aircraft flew with No.4 squadron from Houtem aerodrome in 1915. The final production verisons of the Spitfire beginning with the Mk.21 were powered by R&R Griffon Mk.61 engines and featured a new and redesigned wing with the armament consisting of four cannon. As this new versions of the venerable Spitfire fighter was almost a complete new design, also a new name for the design had been considered, this being the Victor. The first of these new Spitfire versions went to service just in time to see the combat before the war´s end, the later versions the Mk.22 and Mk.24 entered the service after the war. Both these versions differed from the Mk.21 in having lower rear section of the fuselage, bubble-type canopy and a new empennage (originally designed for the Spiteful). The Mk.22 Spitfire production gave 287 machines which, save for one RAF unit, were solely used by RAuxAF squadrons stationed on the British Islands. By the end of 1955 they were regarded obsolete and put out of service. Some of the airframes were overhauled and sold to air forces of South Rhodesia, Syria and Egypt. The Hi tech release of this wonderful aircraft brings the modeller four sprues with nicely detailed styrene parts, one clear sprue and a decal sheet. What justifies the Hi-tech label for this model kit is the addition of a set of photo-etched parts and 3D-designed resin exhauts and undercarriage wheels. The decal sheet offers the choice of four RAuxAF machines, two of which were camouflaged (one bearing racing numbers), the other two in natural metal or aluminium finish. There are also two foreign air force Spitfires, light-grey camouflaged Spitfire Mk.22 in service with the air force of South Rhodesia and aluminium colour finished Mk.22 of the Egyptian Air Force. The Mk.II Tempest became the second version of the basic airframe to be put into mass production, being powered with a Centaurus radial engine. The first of two prototypes was taken aloft for the first time in June 1943, the second prototype followed in September of the same year. The flight testing did not reveal any major trouble and the RAF was excited about these new aircraft. For practical reasons given by the immediate need in the European Theatre of Operations, the Tempest V version was given priority in production though. The first batches of the Tempest II did not leave the production line until October 1944 and it was expected that the first Tempest II equipped wing meant for the Tiger Force would be ready to leave for the Pacific by May 1945. The rapid development of the events of war, however, brought about a change in the situation and from the total number of 452 Tempest II airframes built as many as 300 were not delivered before the war´s end. As the RAF did not hurry to introduce the new fighter to its peace-time service, the only unit to be equipped with these machiches still in 1945 was no. 54 Sqn. In later times, there were another six combat units which operated the Tempest II fighters, these being located in Germany and India. Following the declaration of indepence of India and Pakistan, India received 85 Tempest IIs from the RAF stocks and Pakistan got another 24 airframes. The Hi-Tech release of our Mk.II Tempest brings finely detailed and 3D-designed resin parts (pilot´s seat, control column, rudder pedals, throttle quadrant, cockpit floor, two styles of the main u/c wheels - with the smooth contour tyre and with a tread pattern, the tail wheel, cannon barrels and also the port wing armament bay with its loading panels open, among other detail parts the modeller may also find a PE fret with seat belt buckles, interior and exterior parts and the armament well edges, also the HGW laser-precut seat belts and a set of masks for clear parts and wheel hubs. The styrene parts come on nine grey styrene sprues and one clear sprue with canopy parts. The surface of the kit features very finely engraved rivet details. Comparing with the Mk.V Hi Tech release, this kit brings also the option to enrich your model with under wing rocket projectiles and their racks, the modeller may expect also the different nose parts enabling him to build this radial-engined version. The A4 size instruction sheet is printed in full colour and will meticulously guide the modeller throughout the build. There are also three decal sheets in this release with the option of five camouflage schemes, three of them wearing British colours, one is an Indian machine and the last one belonged to the Royal Pakistan Air Force. Two of the British machines are depicted as camouflaged, one of them with white identification stripes, the third British machine was painted silver dope overall. The Indian Tempest is also in aluminium finish, the Pakistani Tempest flew in desert camouflage. The decal sheets cater also for a complete set of stencilling which covers not only the exterior of the aircraft, but also interior and some stencils for the external fuel tanks. Please note, that we still have a discount on our CMK sets. Check them out on our e-shop - just click on the link below. Set with a new pilot´s seat with harness, resin instrument panel with detail relief, rudder pedals, gunsight and a control column. The instrument faces are printed on a piece of clear film. This set allows the modeller to portray the port wing armament bay open and offers separately cast machine guns, sidewalls and the appropriate panels. Detailed set depicting the Hawker Hurricane reserve fuel tank that was located in the fuselage, aft of the engine and in front of the pilot´s cockpit. The set comes with detailed resin part of the fuel tank itself, its cowling panel, longerons beneath the tank and fuselage bulkheads. This set offers all new main undercarriage well and new and detailed u/c fairing doors. Enhance the look of your new Special Hobby Mirage F.1B model and of course not only this one by addition of a set of figures. This set offers two Mirage pilots and one ground crew member. The set contains all new triple ejector-nozzle outlet exhausts. This set brings the modeller an all new pilot´s seat along with the seat belts. using 3D CAD and the master part made with a 3D printer. Along the detailed resin parts it offers also a photo-etched fret.